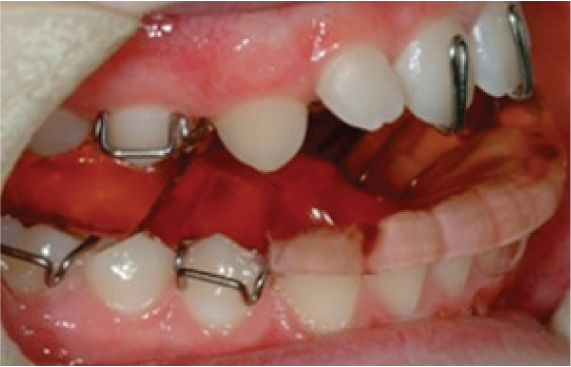 Functional appliances – or functional braces – are most commonly used in young adolescents who have prominent upper teeth. A functional appliance is generally a removable brace, but there are fixed versions as well. It works by encouraging the patient to bring their lower jaw forward. This stretching force maximises the growth of the lower jaw and reduces the prominence of the top teeth. It can get remarkable results. If worn well, it can decrease the need for dental extractions and even jaw surgery. The patient is asked to wear it 19 hours a day. It is removed only for eating, cleaning teeth and contact sports. It has been shown to be an extremely well-tolerated brace. Generally, the treatment is subsequently completed with appropriate fixed appliances.